In middle school, I built websites for fun. In high school, I was an early adopter of Facebook. Today, digital communications is both my hobby and my career. With over 10 years of marketing experience and a natural aptitude for digital communication, I’m offering my expertise to clients interested in telling an authentic and compelling digital story about their brand. Need marketing support? I’m available! Need help developing and executing a successful digital marketing plan? I will work with you to determine your priorities, target audiences, and benchmarks for success to develop and execute a full-service digital marketing plan that includes any or all of the below pieces. Can’t keep up with Facebook messages or Instagram comments? I’ll keep tabs on your notifications and will proactively engage with current and potential new followers to foster your online community and grow your audience. Want to increase your followers, likes, and link clicks? I’ll set up and monitor a paid social media campaign to boost your reach directly to the audience that matters. Is your brand inconsistent across social profiles? Need to polish your Instagram image? I will work with you to cultivate your authentic social media brand and develop a consistent brand strategy for each social platform. No time to write Instagram captions? Can’t fit your thoughts into 280 character tweets? I’ll write posts for your social media channels including hashtags, images, emojis, and more to produce high-performing content. Need to drive awareness of and registration for an upcoming event? I’ll use my proven event marketing strategies via e-mail, paid & organic social media, and word of mouth to reach target registration numbers and increase followers. Need e-mail design help? Want to increase open rates and build your lists? I’ll show you how to reach your target audience directly in their inboxes and turn them into repeat customers with engaging e-mail design and proven list-building strategies. Need a place to host your blog, post your schedule, or share your events? Like this website? I designed it, and I can make one for you, too! Can’t tell a mention from a hashtag? Want to empower your staff to share company news on their own accounts to increase your reach? I conduct one-on-one or group Social Media 101 workshops to teach social media terminology, how to set up a social profile, what to post, how to gain followers, and more. Interested? Let’s chat. Contact me. 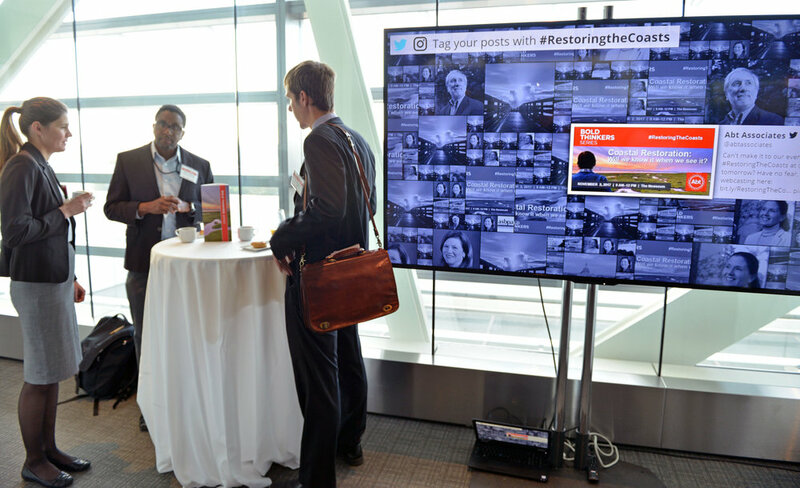 The TweetBeam wall at the #RestoringTheCoasts Bold Thinkers Series event. I lead the corporate social media and e-mail marketing strategy for a global, mission-driven research and consulting firm. Social Media Management: Managing the Social Media Team to write, edit, and schedule engaging daily social media content across platforms, driven by analytics. Event Marketing: Promoting registration for over 100 conferences and events per year through paid & organic social media and e-mail campaigns. Authentic Branding: Building a personable brand and digital community through #LifeAtAbt and global staff Instagram takeovers. Twitter Training Workshops: Train staff members to use Twitter to establish their own professional brand and expand Abt’s digital reach to wider audiences. I serve as a social media consultant for a new podcast working to grow listenership and social media following. Social Media Strategy: I advise on strategy to grow a social media audience and to promote each episode. Content Creation: I write and edit posts for Twitter, Facebook, and LinkedIn to promote each episode launch. Event Planning: Managed DJ bookings, digital promotion, event set-up, and artist hospitality. E-mail Marketing: Developed e-mail marketing strategy to improve event attendance and branding. Website Design: Wrote web content and designed visually engaging website for local yoga & Pilates instructor to promote events and earn new clients. Interested in working with me, or learning more about what I have to offer? Please fill out the form below and tell me a bit about what you’re looking for, and I’ll get back to you promptly.